Tribes Overall: "Overall it was well thought out and flowed seamlessly from one camp to the next. The reception at each camp was welcoming and accommodating. The meals were varied, well prepared and presented. The accommodations were spotless, although we did have the occasional visitor, totally harmless spider and cricket! The game drives were varied and timed to suit us. Both the driver,Godson, and the guide, Maulidi, at Mdonya River Camp were very knowledgable about wildlife and birds and did their utmost to provide us with the best viewing of fauna and flora. The manager, Mary, was always available for advice and/or assistance." Tribes Service: "Yes, and very prompt with her replies to our many and varied questions! 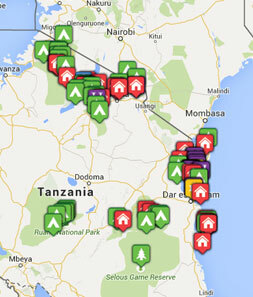 ;-)"
Guides: "I have already mentioned our driver, Godson, at the Mdonya River Camp. He was a very cautious driver and courteous person. In order to discourage tsetse flies from bothering us in the open jeep he always collected elephant dung in order to light it. The smoke from it kept the flies away! Much appreciated. He also was able to identify many of the birds and animals." Social & Environmental Responsibility: "Again it was in the Ruaha National Park that impressed me the most. Our driver had a GPS which he used whenever we came across some lions. He also recorded their numbers and gender and took photos for the Park Management and Research. They want to know if their numbers are declining or increasing. We were also told that they are doing some research into the health of the giraffe population." The flight to the Selous Conservation Region provided a wonderful bird\'s eye view of the terrain. At Lake Manze Camp we found a very enjoyable variety of safaris: foot, boat and jeep. Our tent had a view of Lake Manze where the hippos snoozed and occasionally raised their massive heads to look around. This conservation area has more open plains and sweeping vistas. We were treated to visiting Frederick C. Selous\' grave and then taking a dip in the \"hot spring\". Before descending from the jeep both the driver and the guide did an inspection of the area for our security. This camp also had docking stations for electronics and batteries. The \"banda\" was well appointed and the bathroom was the size of most people\'s bedroom! We did not have a chance to enjoy the pool but it did look inviting. "One of my most memorable events was the \"Bush Breakfast\" that we had on our last morning in Ruaha. The driver, Godson, pulled the jeep into a small clearing next to a very small pond. The area was populated by any impalas as well as baboons. The impalas immediately fled to the far side of the pond while the baboons examined us and then decided we were of no interest. The very young baboons however carried on with their swinging from branch to branch for which they were then reprimanded in no uncertain terms! We enjoyed our breakfast watching all the animals interact. And to our surprise and delight there was a hippopotamus relaxing in the water of the pond. He/she graced us with a giant yawn and some grunting for having disturbed his/her early morning nap. Lovely way to start the day and end our stay in Ruaha National Park." "I found Zanzibar absolutely wonderful! The ferry ride over, the Asmini Palace Hotel in Kiponda, the architecture with influences from India (wooden doors), the Old Fort during the Zanzibar Film Festival, the variety of restaurants, the Forodhani Garden in the daytime and also after dark, the narrow alleyways, the different religious structures: mosques, Catholic and Anlican cathedrals, remnants of the Omani Empire and the Potuguese, British and German colonial periods. "